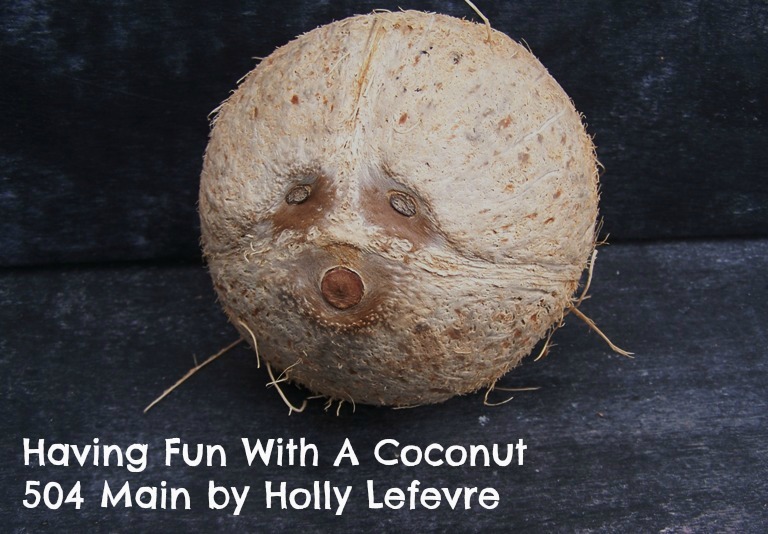 Does it seem weird to you that we decided to spend an afternoon with a coconut? and we love to experiment...so this was perfect fun. A few months ago we were having a bonfire at the beach. and some yams (don't ask - we do not understand how that happened). almost obsessed with this coconut. We cracked it open and toasted some of it (but did not eat it). so, I headed to the store to grab a coconut. 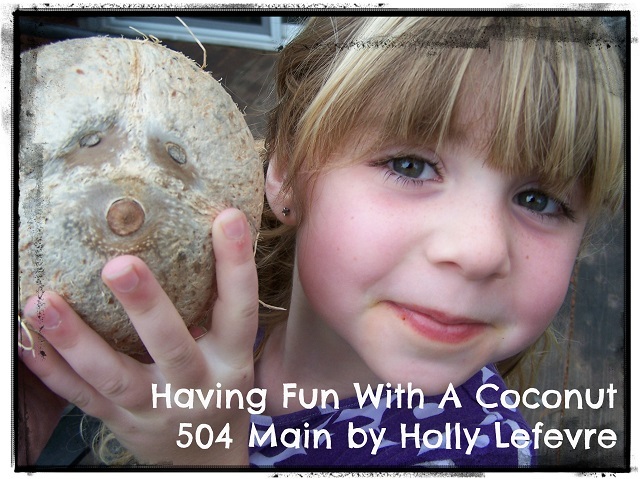 would introduce the kids to the wonders of the coconut. but I did cal in my hubby to help us. (in his earlier Survivor days, perhaps?). Anyway...this is what we did. 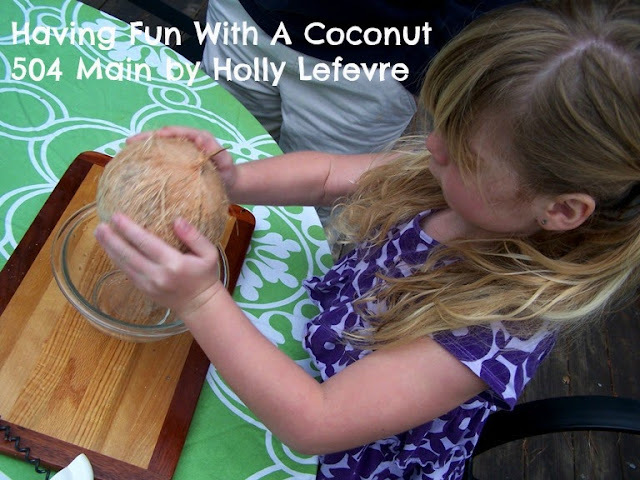 First I had the kids shake the coconut. 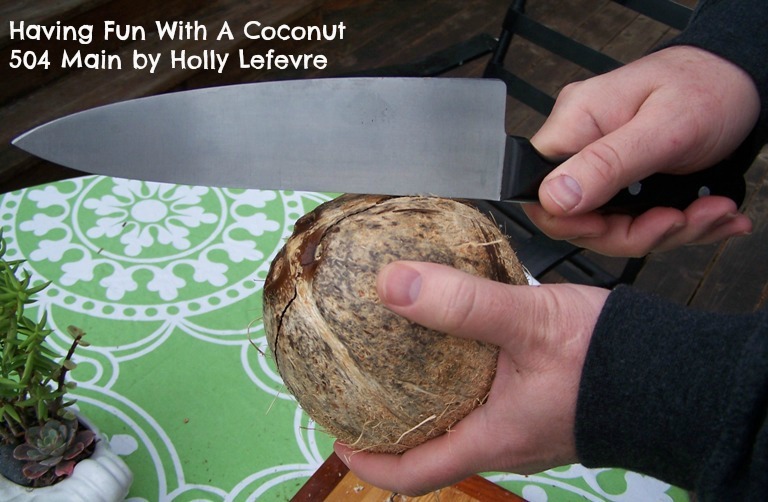 Next it was time to drain the coconut water out. We had to "carve" out a bit more room in our holes to get the water to come out quicker. 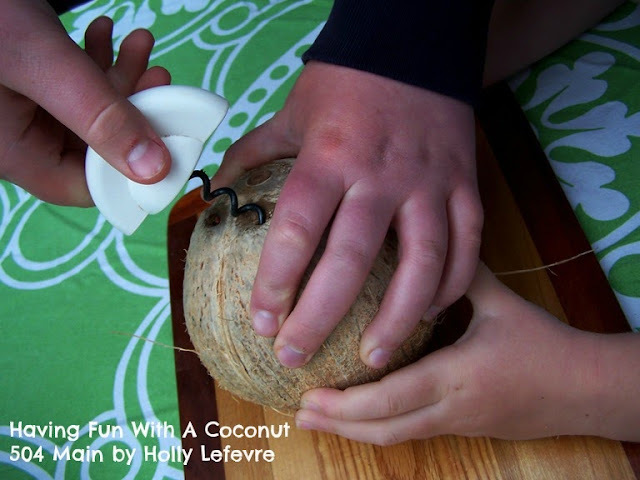 Then it was time to crack this coconut open - A job for adults! I called hubby in for this...due to his experience (or so he says). We used the non-cutting side of a knife and while I would like to say tapped around the center to crack it..it really took a few whacks. You can also wrap the coconut in a towel and smack it with a hammer. 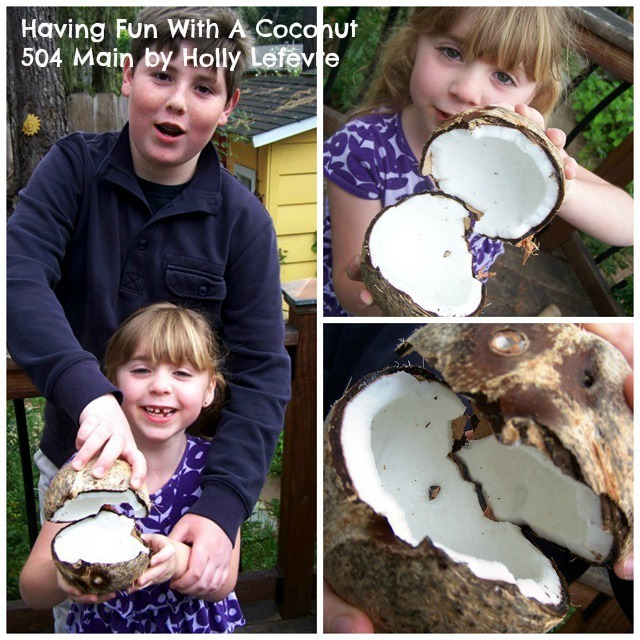 Once the coconut was opened, I had the kids examine it, and taste just a teeny bit. They goofed around a bit...it looked just like a crazy head with a big mouth. We took the coconut inside and baked it to remove the meat from the shell. 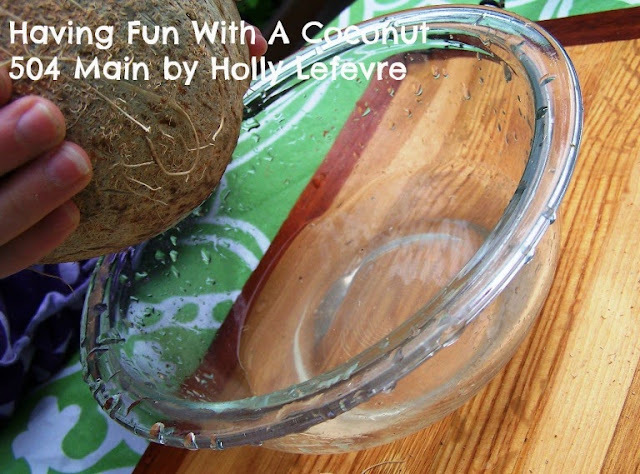 Place the cracked coconut in an oven safe dish and bake for 20-30 minutes. I could see the meat start to separate from the shell...so just watch it! Remove from the oven, let cool. Once cool it is super easy to scoop the meat out of the shell after this. 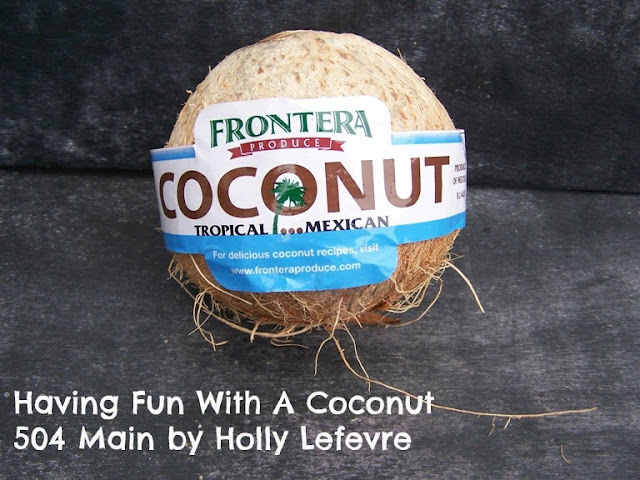 Once you have the meat ready, you can grate it and toast it and enjoy the delicious coconut. What crazy things do you do to entertain your kids? I have to agree about the coconut water. I was not too eager about it after I tasted it. LOL! 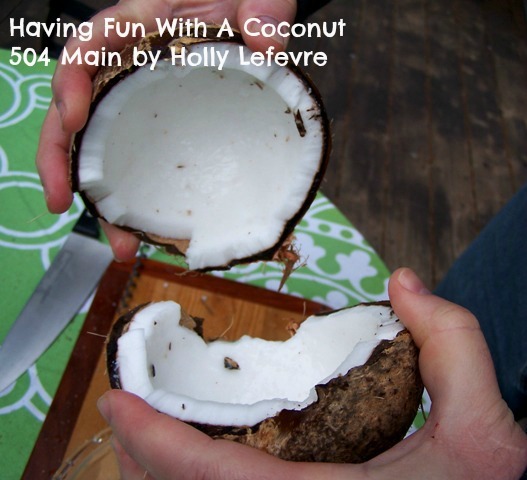 The coconut meat, on the other hand, I could eat all day. LOL! But what I REALLY want to know is...where did the coconut and yams com from? 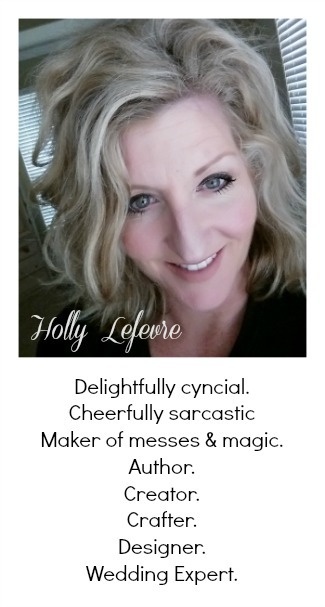 Sounds like something my own kids would have come back with when they were younger. 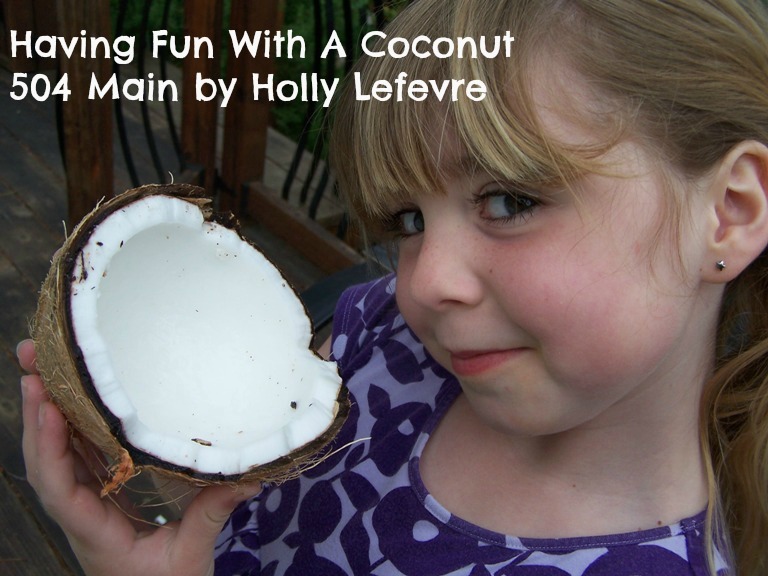 Holly, it sounds like the kids got a lot out of the activity with the coconut! I can see this being a good hands-on science activity at school too! 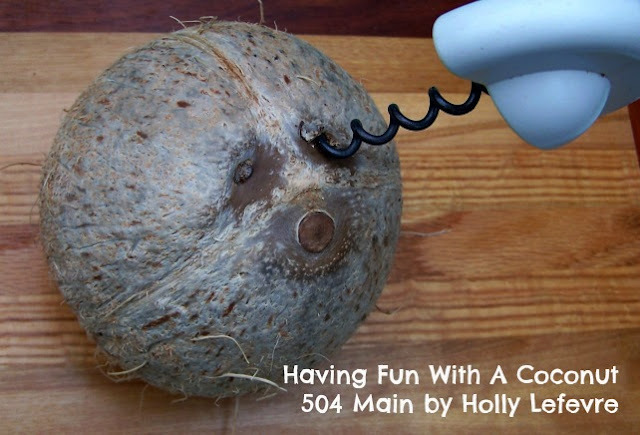 This is so fun Holly! I didn't know you should bake it to get the meat out - that's cool!